Wow, check out the tribal marks on these guys! The cover of Iya Alakara (Awurebe Records DELP 8303, 1983) is arresting, the music on the inside even more so. 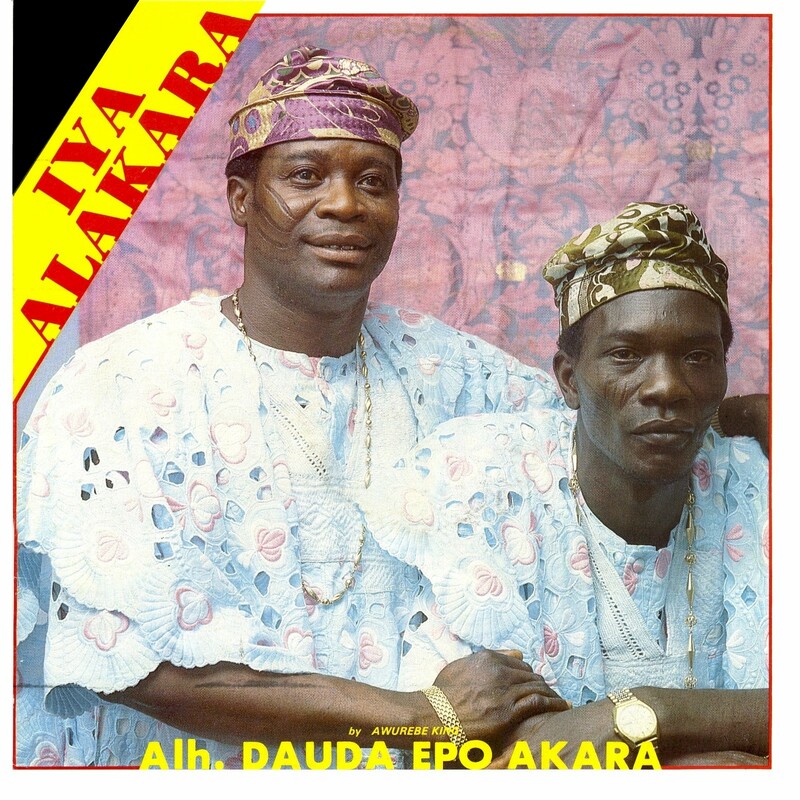 Alhaji Dauda Epo Akara called his music awurebe. I'm not exactly sure where it stands in relation to other percussion-fueled Yoruba musical styles like fújì, àpàlà and the like. Maybe it's just a marketing gimmick. Whatever the provenance, it's very impressive music! According to his sparse Wikipedia entry, Dauda Epo Akara was born on June 23, 1943. The Nigerian newspaper This Day reported that he passed February 18, 2005. Wikipedia says that he started out as a practitioner of wéré (or ajisáàri), an Islamic style of music meant to be played during Ramadan, and updated it after returning from his hajj to Mecca and Medina. At least judging by this recording awurebe lacks the religious focus of wéré , but shares the characteristic vocal flourishes of "secular" Islamic styles like fújì and the like. Three years have passed slowly by since Awurebe King Dauda Kolawole Akanmu, known in show business as Dauda Epo Akara passed on, in 2005. His exit marked the end of a musi-cultural era, the era of a generation of musicians whose roots are deep in the urban social fabric and heritage of the Yoruba speaking people of South Western Nigeria. An indigenous music type whose hallmark is the syncopation of rhythms generated in patterns that are intricate, Awurebe is the fusion of àpàlà, sákárà, woro and even dadakuada from Kogi and Kwara States of Nigeria. It is the perfect blend of these various musical cultures that have given it a uniquely definitive sound identity. While Haruna Isola and Ajao Oru pioneered àpàlà and took it to a level where it became universally accepted, Yusuf Olatunji popularised sákárà and established it as an acceptable social music type. And of course the likes of Batile Alake took on the female version of these music forms and handed it down to the likes of Salawa Abeni who is still carrying on the tradition. 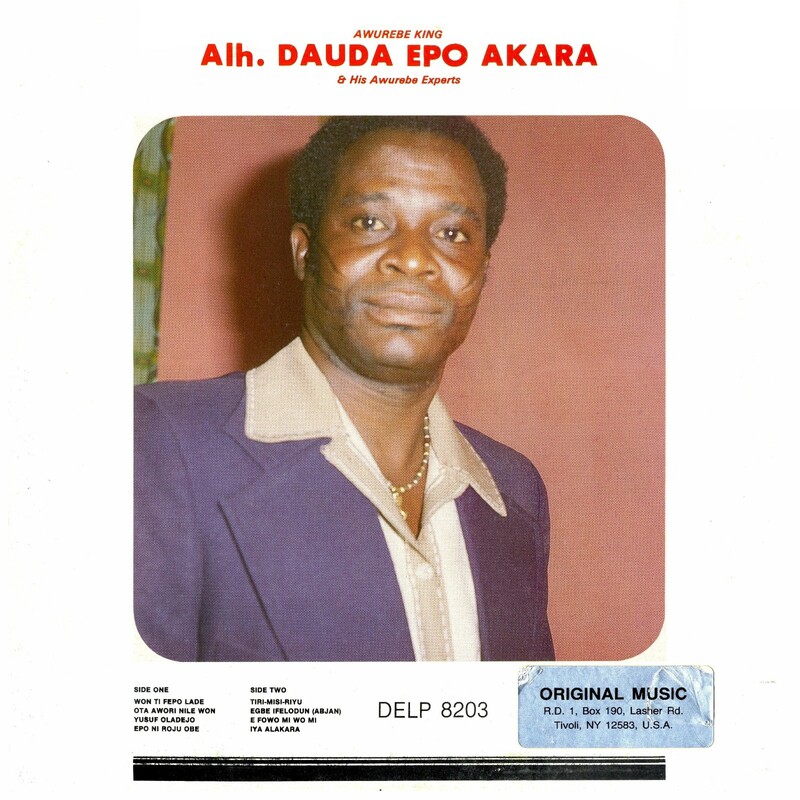 Even though Epo Akara's awurebe came much after the first generation of our traditional musicians, his fusion was blended to fall into the same era. As a matter of fact, like fújì music, awurebe is a product of the street music performed during Ramadan called wérè. He was influenced in the same way that Alhaji Ayinde Barrister was, but this influence affected them differently. While Barrister merely accompanied his social commentaries with the legion of drums and other percussion instruments in a direct fusion, Dauda, who, perhaps was operating from a point where he had been influenced by almost all the social music genres, decided to fuse elements of everything into one whole unit. Enjoy this deep, deep Yoruba roots music! Download Iya Alakara as a zipped file here. In preparation for this post, I did a little research on the question of "tribal marks" in Nigeria and discovered that they are, or used to be, most common among the Yoruba people, although other groups have them also. I take it they are considered somewhat old-fashioned these days, as indicated by the delightful video below. I think they're kind of awesome myself!